The Debut of Thorne & Cross: Haunted Nights LIVE! 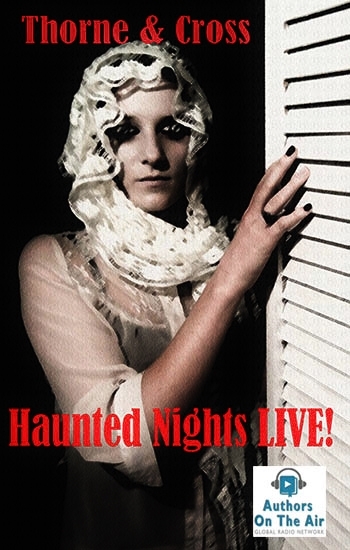 Haunted Nights LIVE! debuted last week with our first guest, Q.L. Pearce, the bestselling author of more than 150 books including film tie-ins for the Fox animated film Titan AE and the Universal animated series Land Before Time. Click here to go to the show. Later this month, our guest will be New York Times bestseller, Doug Clegg and, in just a few days, Michael Aronovitz, author of Alice Walks and The Voices in Our Heads, will be joining us. For the full guest list (so far) visit my website at the Haunted Nights LIVE! page. Stay tuned to Thorne & Cross: Haunted Nights LIVE! where we’ll be talking about all things horror with the biggest names in the business. From fiction writers and paranormal investigators to haunted spots and true ghost stories supplied by our listeners, Haunted Nights LIVE! features fact, fiction, and that indiscernible gray area in between. This show is part of the Authors on the Air Global Radio Network with more than 2 million listeners in 44 countries, and we’re excited to be part of it! Give us a like on Facebook, or follow us on Twitter.